6 Reasons You Need to Go on a Hut-to-Hut Hiking Trip in the Dolomites! 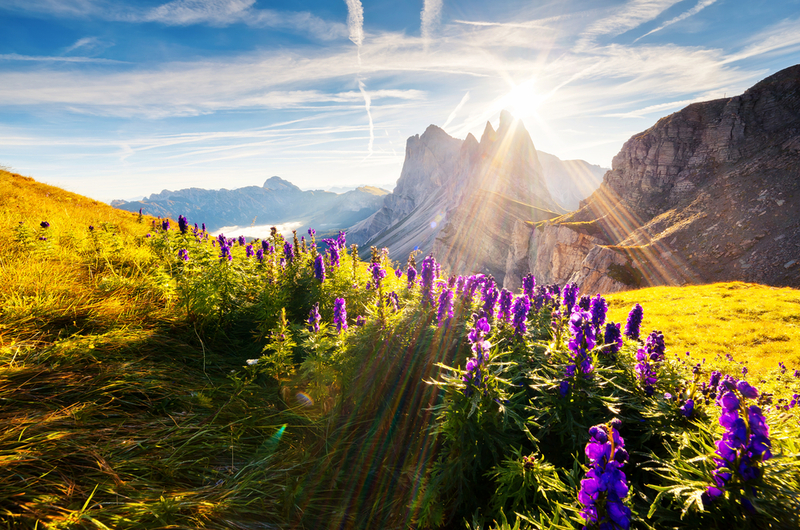 6 Great Reasons Why You Need to Go on a Hut-to-Hut Hiking Trip in the Dolomites! Imagine a place where perfectly groomed meadows sit high above chocolate box villages as piercing blue rivers wind their way through the valleys, cow-bells chiming rhythmically in the distance. A place where any lingering stress simply disappears into thin air. It sounds pretty idyllic, doesn’t it? While the Irish travel in their masses to the Alps, Dolomites and Pyrenees in winter for a spot of skiing, it is a trip we rarely consider making in summer. And we are here to tell you that you are all missing out … BIG TIME! In June, we are inviting all of you to turn that aforementioned Alpine idyll into a reality. The Dolomites in Italy are known as one of the most dramatic mountain ranges in the world and we will be spending a week exploring the very best that the area has to offer on a hut to hut hiking trip. 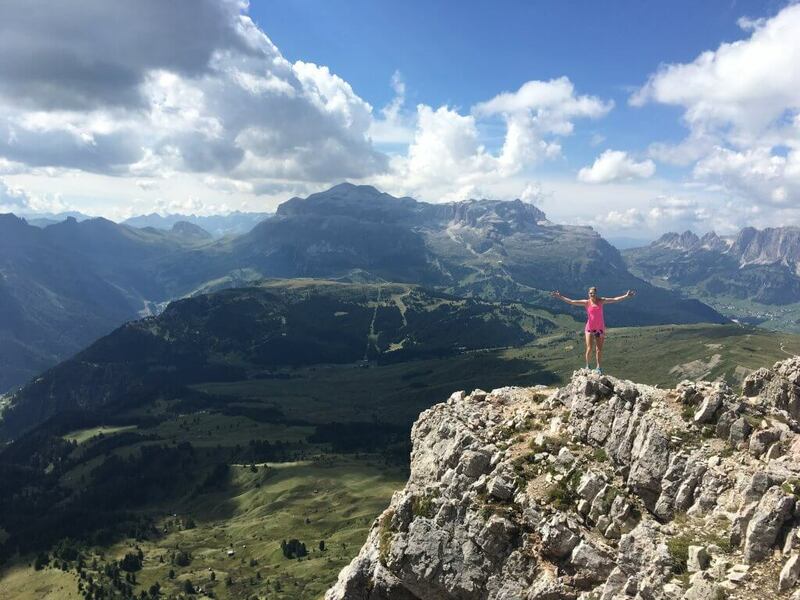 Kicking off in Val di Fassa and ending in Roda de Vael, we guarantee this trip will leave you feeling fitter, happier and more relaxed than ever. And, if you still aren’t quite convinced that it’s a great idea, then read on as we list 5 more great reasons why a hut-to-hut hiking trip should be at the top of your adventure travel bucket list. I have travelled the world and few places can compare to the Dolomites in the summer months. Sharp, rocky peaks loom into crisp blue skies as vibrant meadows sit below in their shadows. And keep your eyes peeled for amazing wildlife too. The sight of chamois, a small local antelope, skipping up sheer cliff faces is something special. And who wouldn’t fall for marmots, the cutest little furry creatures that scamper around, whistling to each other looking for a mate?! The Dolomites are a firm favourite amongst the world’s bravest and most accomplished Alpine climbers (you just need to take one look at those sheer rock faces to see why). On our unique hut-to-hut hiking trip, you will walk in the shadows of the Vajolet Towers, which were made famous by some of the world’s best known Alpine climbers like Paul Preuss and Tita Piaz. If you’ve never heard of them, how about the fact that the towers were also featured in the now infamous opening scene of Sylvester Stallone’s ‘Cliffhanger’?! If it’s a room with a view you are after, then look no further. Unlike other hiking trips where you stay in the same hotel for seven days, the hut-to-hut experience will see you staying in different mountain huts every night – each in an even better location than the last! Don’t be too put off by the word hut either! 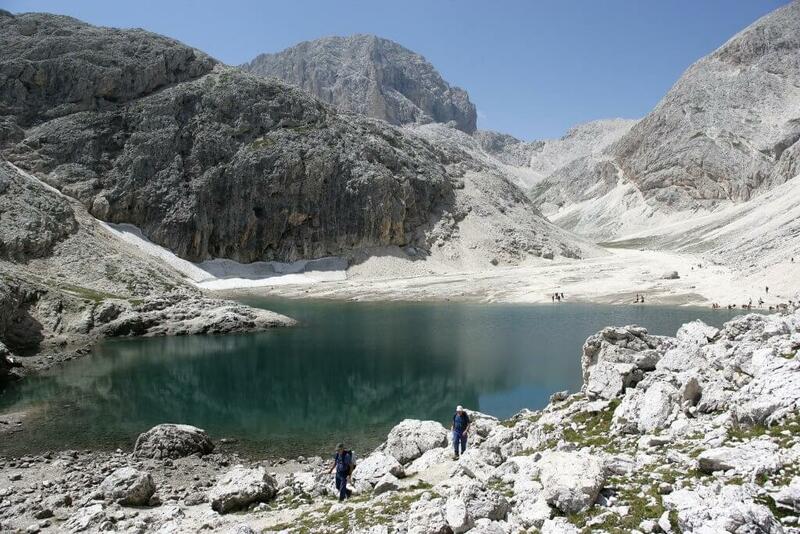 This translation does no justice to these mountain ‘rifugio’ as they are known in Italian. These huts range from basic but cosy affairs where you’ll share a communal dorm room to seriously cute ones decorated with love hearts carved in the wood. So cast the word hut aside and instead picture, comfortable and oftentimes cosy and romantic accommodation which has fed and watered hungry and tired hikers for generations. The silence of the mountains by night, spectacular sunrises and sunsets, and the epic display of stars when darkness falls are the icing on the cake! The food in the Dolomites is exquisite. Taking influence from both Italy and South Tirol, the mountain huts serve a number of local dishes. My ‘don’t miss’ favourites are fresh tortellini stuffed with local ham and Tris di Canederli – three delicious balls of farm-style dumplings, and an array of local game meats. Oh and let’s not forget about dessert! Few things in life can beat a good Apfelstrudel and homemade custard which the Italians have mastered and brought to a whole new level. One of my favourite wines (called Arunda) of all time was consumed on the terrace of a remote mountain hut in the heart of the Dolomites. 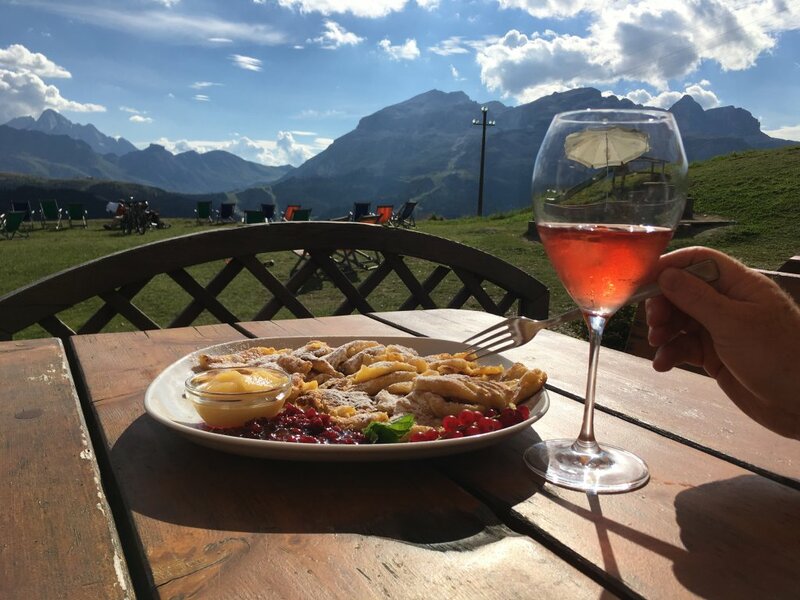 The hills and valleys of the Dolomites are home to three grapes, so whether your tipple of choice is rosé, white, red or sparkling, you will be treated to an array of good local wines wherever you go. Trenches, fortifications and tunnels tell the tale of the battles that took place in these mountains between Italy and Austria from 1915 to 1917. The unique Dolomite front is a world that can only fully be discovered on foot. The nature of war in the area was dictated by the landscape which led to fortified mountain ledges and crevices and via ferrata which are still in amazingly good condition and are accessible to walkers of all abilities. The Outsider hut-to-hut hiking trip runs from 22-29 June 2019. The price is €999pps and includes return flights from Dublin, two nights half-board in a three-star hotel at the start and end of the trip, five nights half-board in mountain huts and all transport (including cable cars at various points on the trek). For more details, email: outsider@topflight.ie; tel. 01-2401753, visit the website.